My son was, he would have been twelve years old, and we went and we had some turtle traps set in the Potomac River. And it was in the area of the tidal influence so the tide could come up and down a foot there even though it was freshwater. And we had turtle traps set and we went out to check the turtle traps. Well we were on our way to the airport; we were taking two famous herpetologists Justin Congdon and Steve Morelli to the airport. Michael, my son, and I waded in the river while Justin and Steve stood on the bank watching us in their nice shoes, and as we were moving around, I bumped into something. The water was about two feet deep and the mud was about two feet deep, so we were slogging through the mud and I hit this object—auggh! It’s a big red-bellied cooter. I’d seen little ones there but I had never caught a big one. I thought, this is a great big one. And we all knew because we were all herpetologists, right?—professional herpetologists—we all knew that turtles don’t bite under water anyway; they just try to get away. And I reached down and all of a sudden this mouth, big mouth, clamped on my ring finger right there. And my cheek was grazing the water. 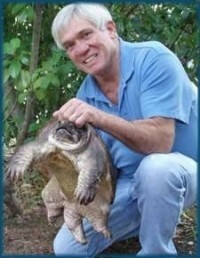 And it turned out it was a snapping turtle because it was too big to be a cooter. So I reached to the back of it and it released its grip a little bit, and I yanked my finger out, except I didn’t because it clamped down even harder. So Justin and Steve on shore thought this was very funny. Then suddenly, Mike said, “Ed the tide’s coming in! The water’s rising!” Meanwhile, my arm was extended and I would be blowing bubbles before too long if I didn’t do something. And Steve and Justin—as I said they had on very nice clothes and could not come in the water, but they did know that I had keys to the vehicle in my pocket and they had a plane to catch. So they got serious about it and said, “What can I do?” And we all decided that I’m going to have to pull this turtle up through the mud. It was under a foot of mud, and as I did it was biting down really hard, and I got it up to the water column, pulled it up real fast then. And of course we all knew—first we knew that snapping turtles did not bite under water; we knew that before—we know different now—and we also knew that once they’re out of the water, they won’t let go. But fortunately it was just the other way around. When I got him to the surface, he opened his mouth, got my hand out in the speed of a striking snake, and dropped the turtle. And one of the two from the shore, Steve, said, “Catch it!” And you know, I thought, you know, that’s what we’re out here for is to do this study. So I grabbed the turtle, took him over. We had Pesola Scales, weighed him he was twenty-one pounds. We marked him, and he’s still swimming around in the Potomac. It is an example that it only takes a sample size of one sometimes, and we also found out what a finger looks like after a bite like that. You could see the bone all the way around.